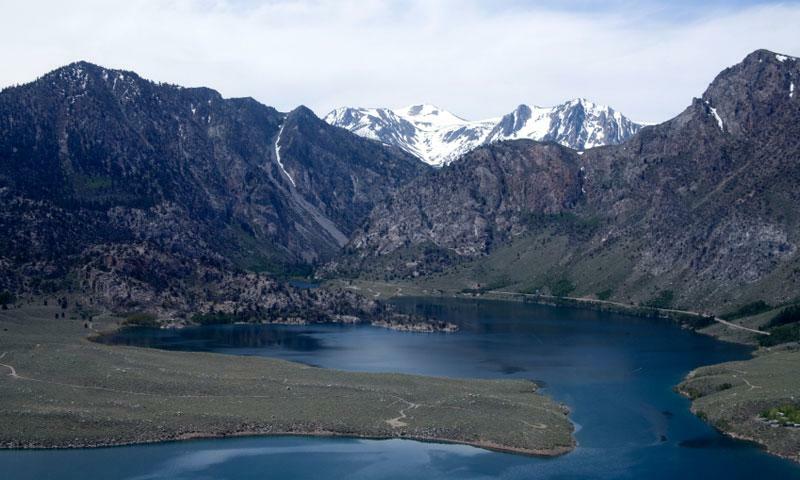 Visitors come to Lake Crowley for its legendary fishing, world-class boating, lakeside camping, and breathtaking scenery. Anglers enjoy Crowley Lake’s legendary trout fishing. Explore the water by boat or kayak. Get quick lake access by camping at one of Crowley’s lakeside campsites. Lake Crowley is nestled in a valley between California’s majestic Sierra Nevada and the Glass Mountains. The area boasts legendary fishing, water sports, and camping. Crowley Lake is located about 12 miles south of Mammoth Lakes off US 395. Crowley Lake has two fishing seasons. From the last Saturday in April until August 1st, the rules are a five-fish per day, 10 in possession, no size limit. From August 1st until October 31, you’re allowed two fish per day, no more than 18-inches in size, using only artificial lures with barbless hooks. Crowley Lake is renowned as one of the premiere fisheries in the Western United States. On opening day between 6,000 and 8,000 people show up in anticipation of the fishing to come. Native fish include chubs and suckers. Trout fisherman can expect monster brown and rainbow trout (the lake record is a 26 lb. brown). Since Crowley is a large lake, a boat or float tube is useful. Rentals are available from the nearby Marina. Consider hiring a guide to get the inside info on the most productive fishing spots. Lakeside camping is available for both for RV and tent campers. RV Hook-ups cost $40.00 per night while tent sites are $15.00. Campers have access to the marina and general store. The campgrounds are open seasonally, usually from April until the end of October. Lake Crowley is a favorite amongst water skiers, wake boarders and kayakers. The local marina offers 200 private boat slips, and rentals are available. Boaters must access the lake through Crowley Lake Fish Camp. Crowley Lake is actually a man made reservoir that supplies water to the city of Los Angeles. Crowley Lake is 12 miles long and 5 miles wide.